Jeff Brown is the former co-host of an award-winning and nationally syndicated morning show, an award-winning production director and copywriter, and the creator and host of the successful Read to Lead Podcast where he has interviewed a number of New York Times bestselling authors including Dan Miller, Daniel Pink, Chris Brogan, Gary Vaynerchuk, and Simon Sinek just to name a few. He has 26 years of experience in the radio world and a career that includes co-hosting an award-winning and nationally syndicated morning show. Jeff has developed a large following by choosing great guests, asking great questions, and producing a high-quality podcast. 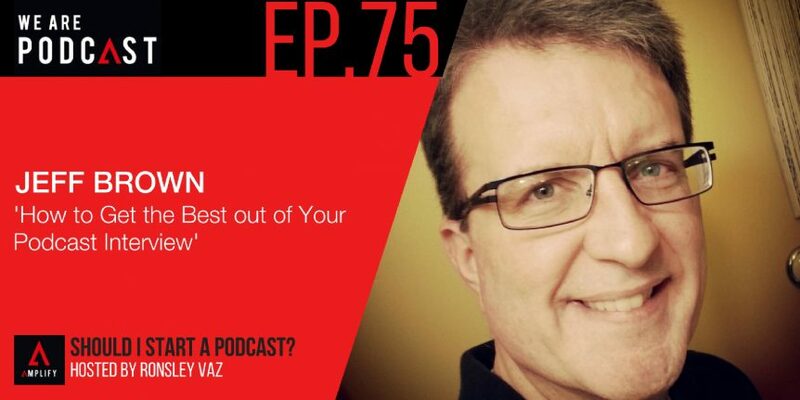 He shares with us his passion for reading and some great ideas for starting or improving your own podcast. Even if you’re not a podcaster, you’ll be inspired by his journey and will learn how to improve your leadership through the power of reading. Podcaster Academy is another project designed by Jeff to help you gain confidence in your interview skills behind the mic, understand more fully how to intimately connect with your audience, and how to present yourself in a more conversational manner that flows. Jeff also offers strategies on how to monetize podcast content as well as successful methods for formatting a podcast. If you are thinking about launching a podcast or currently podcasting you will want to take his course. How did Jeff begin the Read to Lead podcast? What is his podcast all about? Since leaving my job I just said to myself “I’m going to make this work whether it was podcasting or whatever it is, I’m going to make this work someway, somehow.” And I have been self-employed ever since. I wouldn’t change a thing. There are lots of podcasts being created that aren’t taking full advantage of the concept or the idea or the fact that this medium gives you the opportunity to not get it right the first time. When I did radio for almost half a decade, most of that was live, and so you got one chance to get it right. What happens when you don’t remove mistakes and remove parts of conversations that actually don’t add anything to the overall conversation? When you leave those things in there, episode after episode, this thing called listener fatigue begins to set in. And so consciously I come to your show, at the back of my mind thinking this is a 30 minutes episode, 10 minutes of which it is going to be a waste of my time. “It’s to the point that when it comes to the content creator, there’s a lot of the same kinds of podcasts that concerns me a little bit. It really makes it hard for the listener. Curation becomes really important. It really makes it hard for the listener to find.